August 6, 2016 West End, Downtown, Lowertown 16.3 Miles A trip Downtown via Shepard Road seemed like a good idea. And so I got onto the Sam Morgan trail and took it from Highland Park to Lambert’s Landing on the edge of Downtown and Lowertown. The boarding area for tours of the M/V Mississippi. Docked at the Landing was an enormous Army Corps of Engineers tow boat awash with people. Then I saw the sign advertising an open house on the boat. I hesitated only to lock my bike before scaling the gangplank to the M/V (Motor Vessel) Mississippi. The bow of the five-deck Mississippi. The pilothouse, where navigation is done, is the top level. I worked my up several very clean and polished flights of stairs to the boat’s upper-most level, called the pilothouse. That’s where I met Jeffrey Hopkins, nattily dressed in his khaki Army Corps uniform, each shoulder decorated with a black epaulet with three gold stripes and a gold anchor. 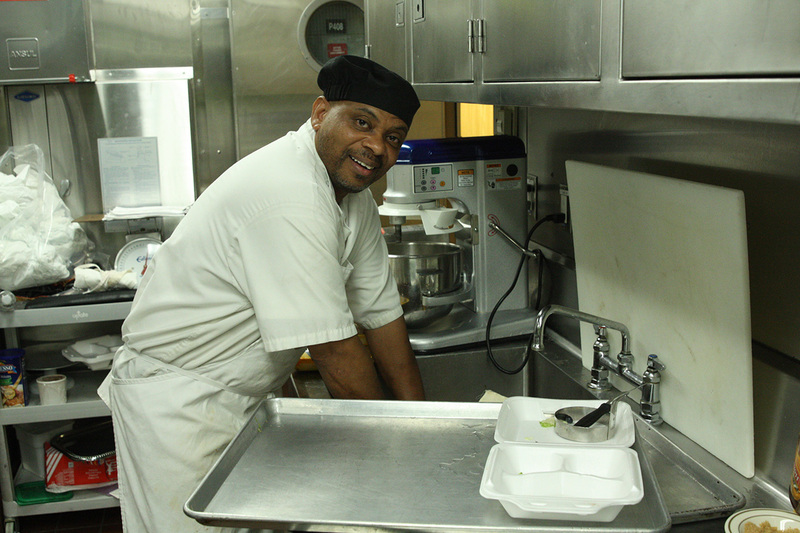 Jeffrey Hopkins, first mate-steersman of the M/V Mississippi. Jeffrey is a first mate-steersman for the M/V Mississippi, the largest diesel towboat operating on the Mississippi River. The Memphis, TN-based Mississippi is 241 feet long, 58 feet wide, and five decks high. the vessel holds up to 150 passengers, has 22 staterooms for crew and visitors, a dining room that seats 85 and a conference room that seats 115 people. The pilot’s station has three levers, one each for the three large diesel engines, and many other controls and meters the pilot needs to control the boat. 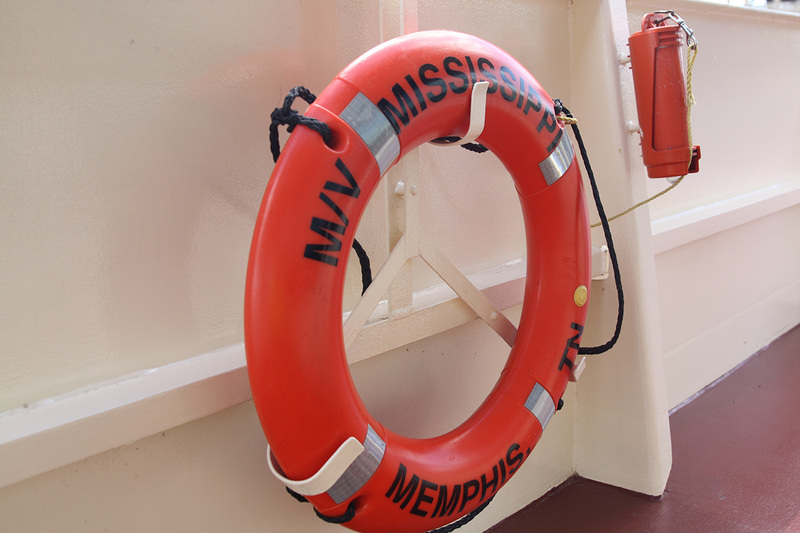 A life preserver hangs on the port side of the Mississippi. The stern prominently identifies the M/V Mississippi. 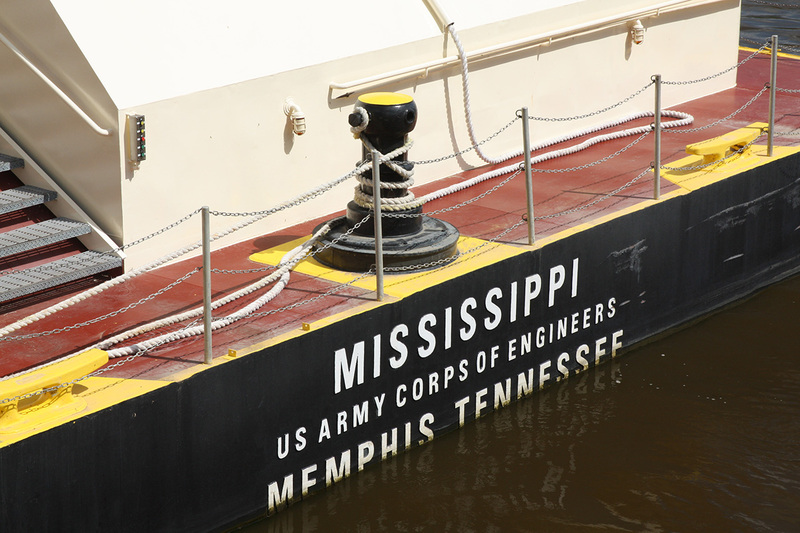 The other part of the M/V Mississippi’s mission is political. Each spring and late summer, the Mississippi River Commission conducts a series of public meetings aboard the vessel. “Everybody that touches this river has a stake, a voice, and the commission is here to listen to that voice and essentially push that up to Congress to help direct where future monies go towards this River.” That’s why the pilot house looks a lot like a family room, with plush leather couches and chairs, end tables with magazines and a coffee pot. The two leather couches in the pilot house. 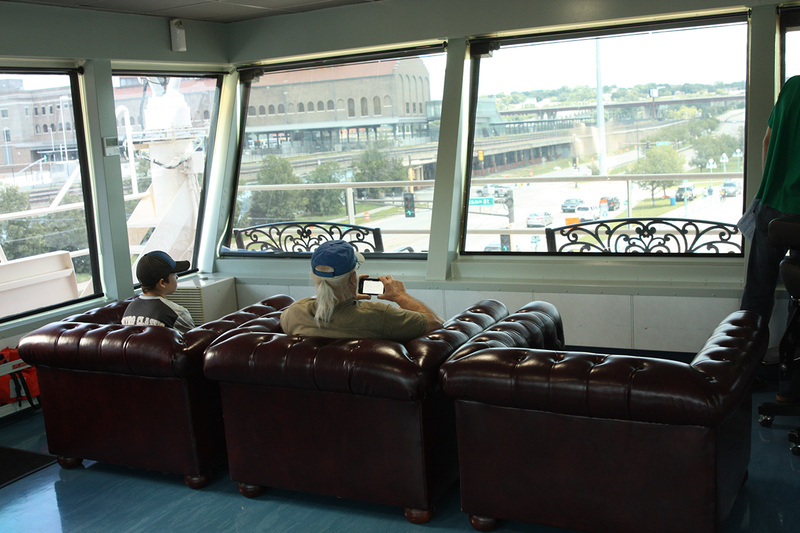 Two visitors pause to take in the view east from the pilot house. “This boat is built for so many different missions. It’s got a lot of staterooms on here for major events. 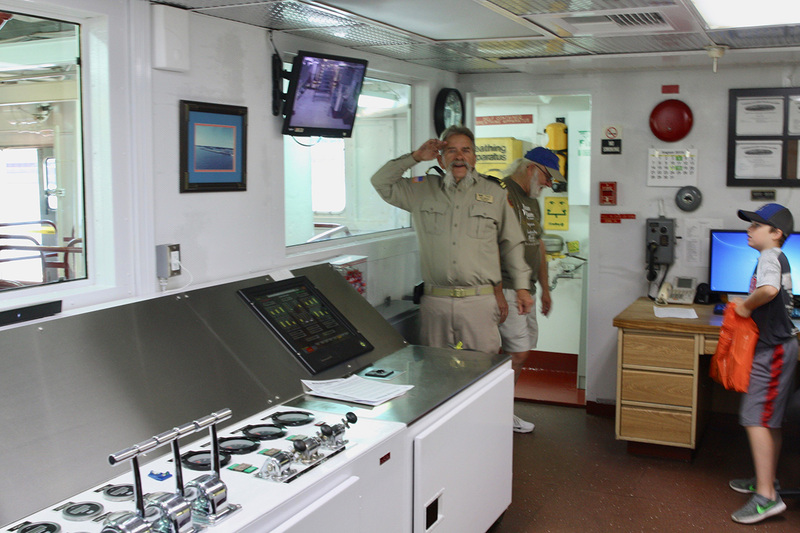 It becomes a command center during major events.” Jeffrey Hopkins, first mate-steersman of the M/V Mississippi. Assistant Engineer W.D. Mohon gives a salute in the engineering control room. 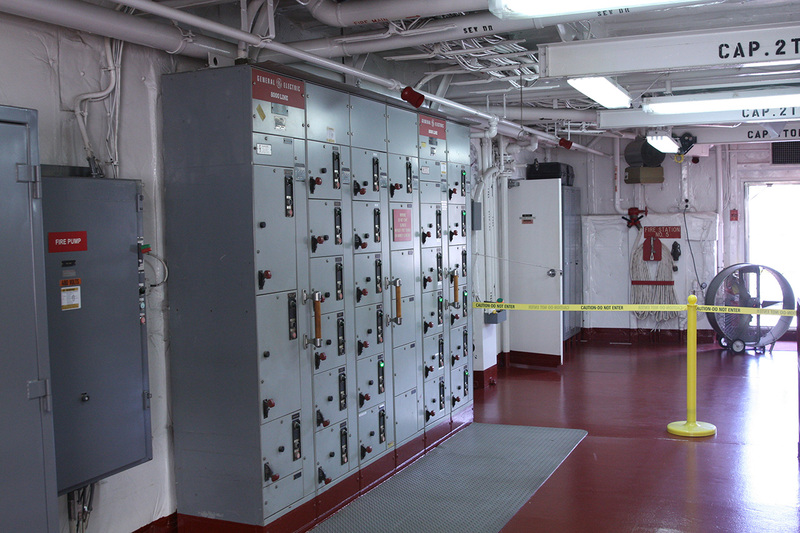 Large circuit breakers and power controls for the many electrical systems aboard. 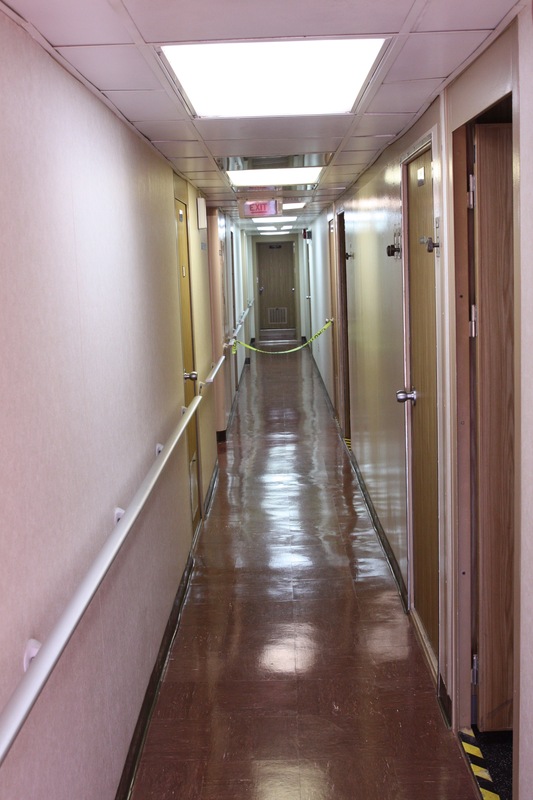 Staterooms line both sides of this corridor. 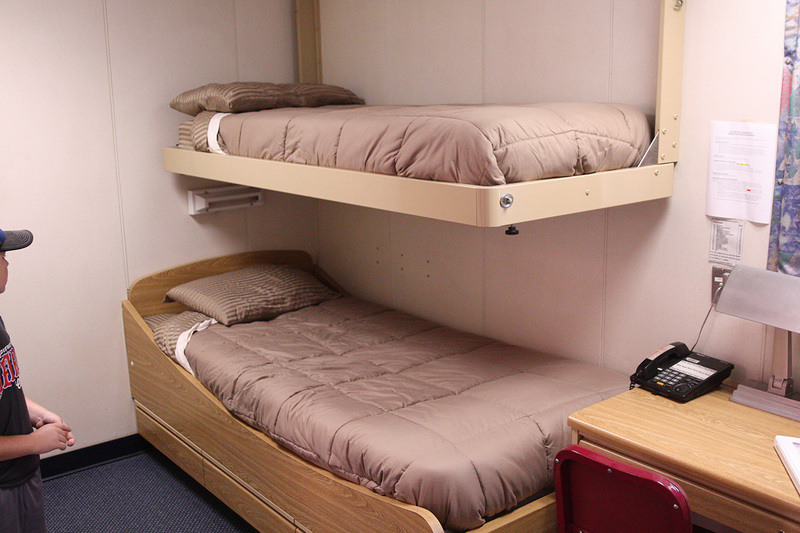 One of the staterooms. All the comforts of home. Adorned with just the necessities, a bathroom aboard the vessel varies little from many public restrooms. “We do wash your clothes on here and we were fed several meals a day and we have an exercise room, but just getting moved into it is a little bit of work. Now, if you’re somebody that it isn’t a regular member of the crew you have to plan ahead for trying to get on the boat with one backpack or small amount of bags. 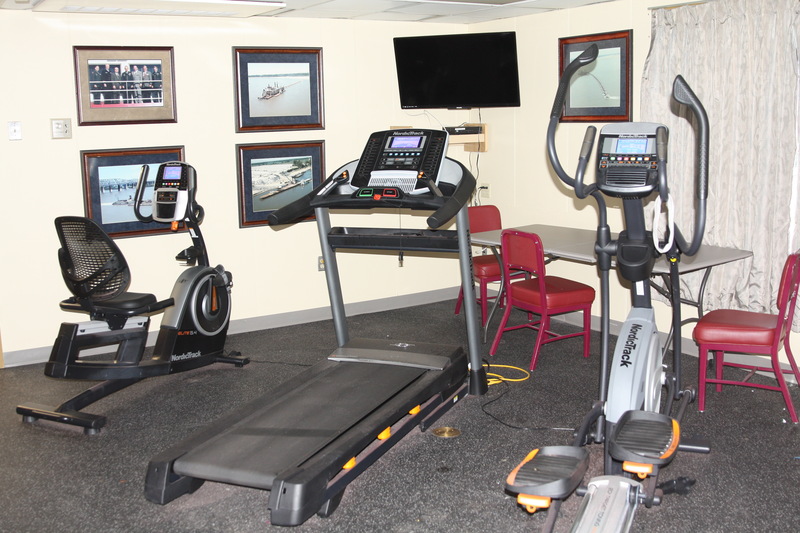 The modest exercise room is open to crew and visitors. 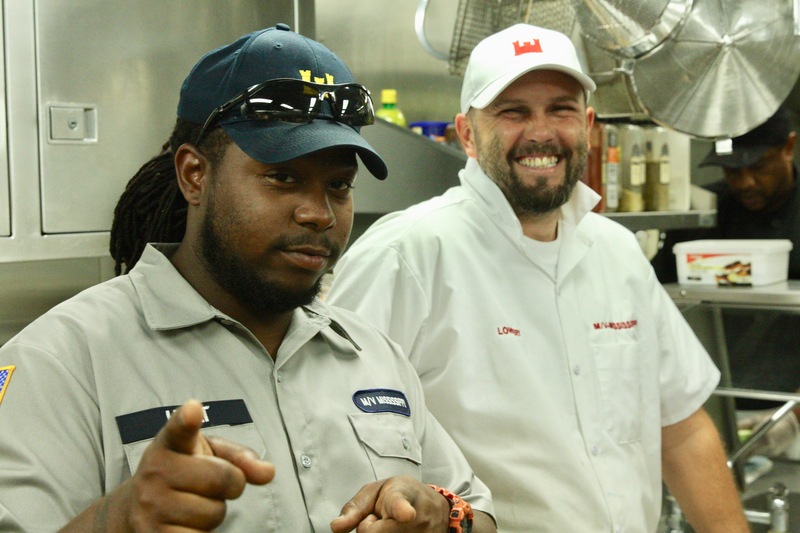 Two crew members, an engineer (left) and cook/steward (right) are happy to see new faces aboard. One of the cooks tidies up from a meal. Between the conversation with Jeffrey and the tour of the Mississippi, I managed to stay beyond the end of the open house. In my defense, I wasn’t the only person to disembark late. Upon getting back on the bike, my next stop was at Needels Company, manufacturer and reseller of cleaning supplies and equipment. 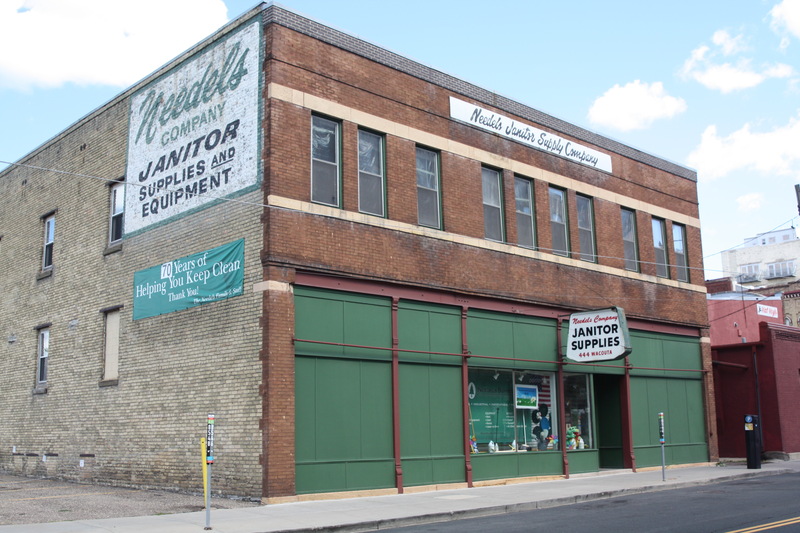 The company has been at 444 Wacouta Street for more than 75 years. 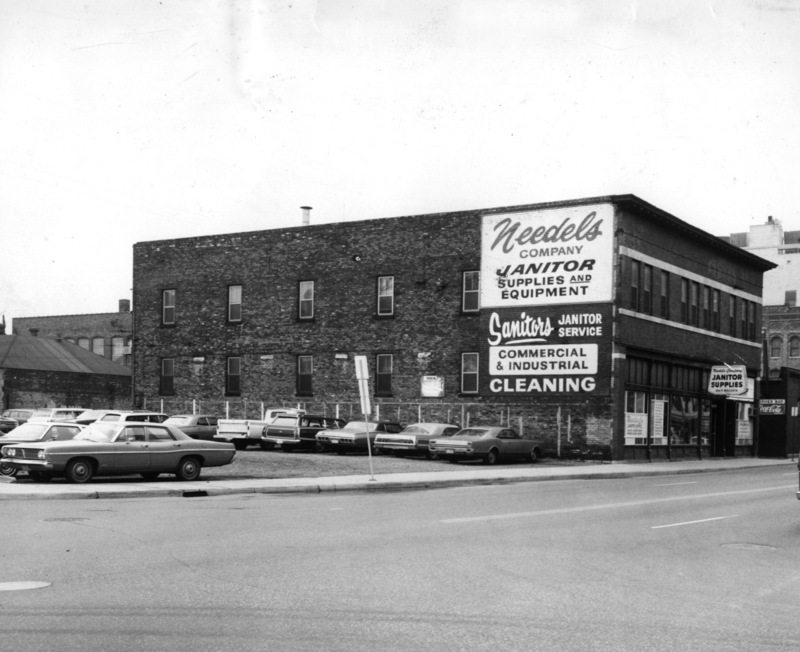 Needels Janitor Supplies at 444 Wacouta Street in 1963. Photo courtesy Needels Supply. Needles Janitorial has changed only slightly since opening here. 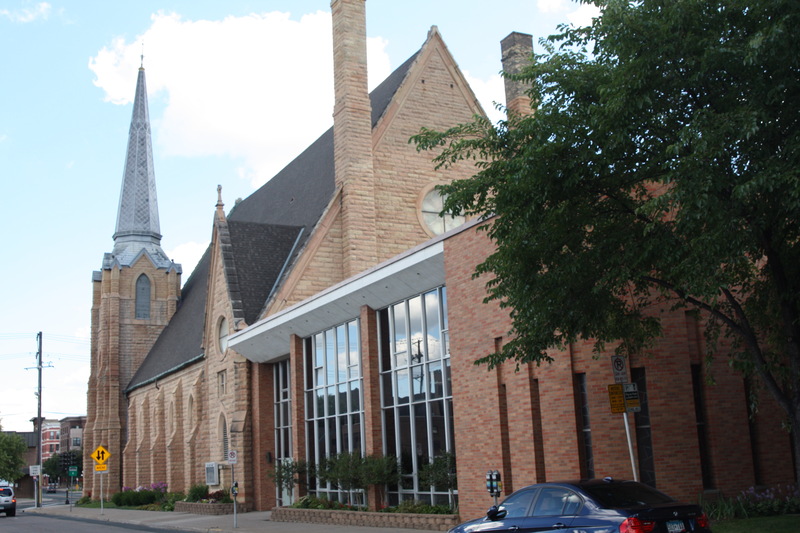 Within two blocks to the north are a pair of dramatic churches that have been in Lowertown for decades. 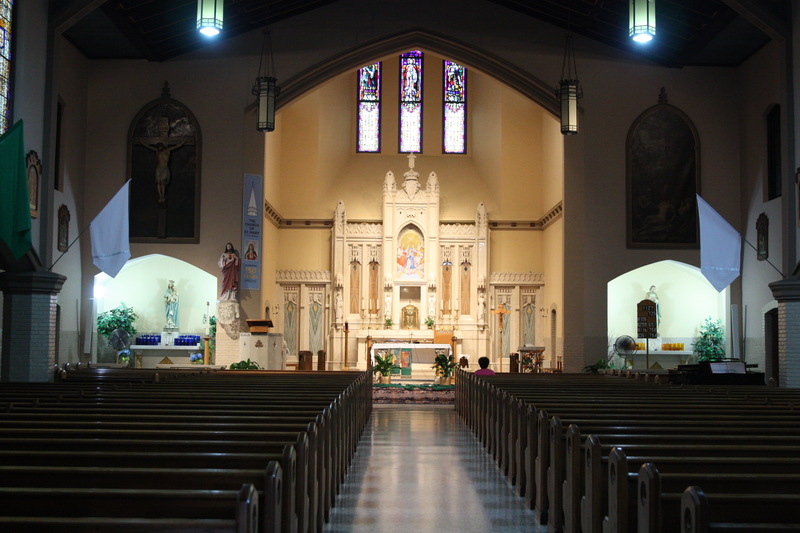 The first is The Church of St. Mary, a Catholic house of worship built in in the early 1900s. 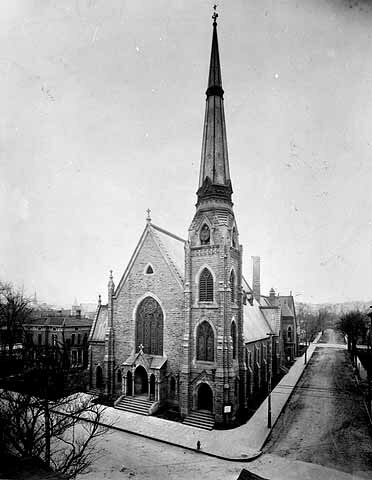 Most noticeable is its landmark white steeple that rises above Lowertown. St. Mary’s Catholic at Eighth and Wall Streets. 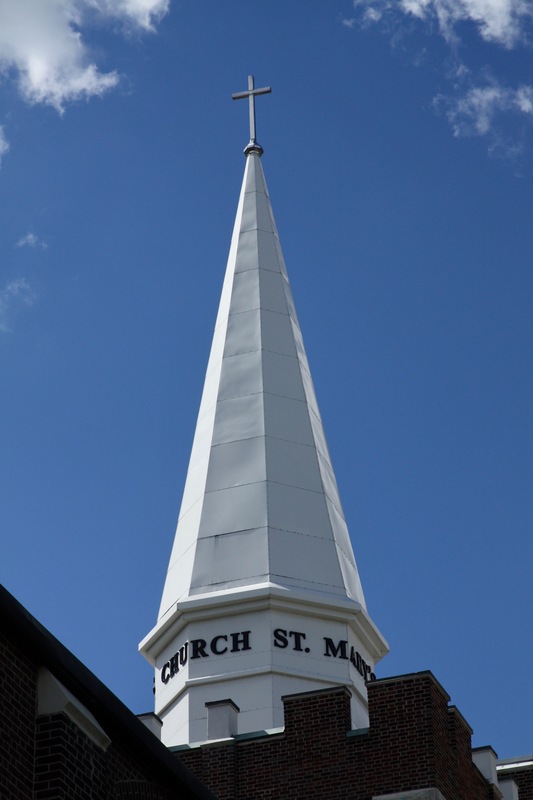 The brilliant white steeple of St. Mary’s Catholic Church stood in impressive contrast to the azure sky. 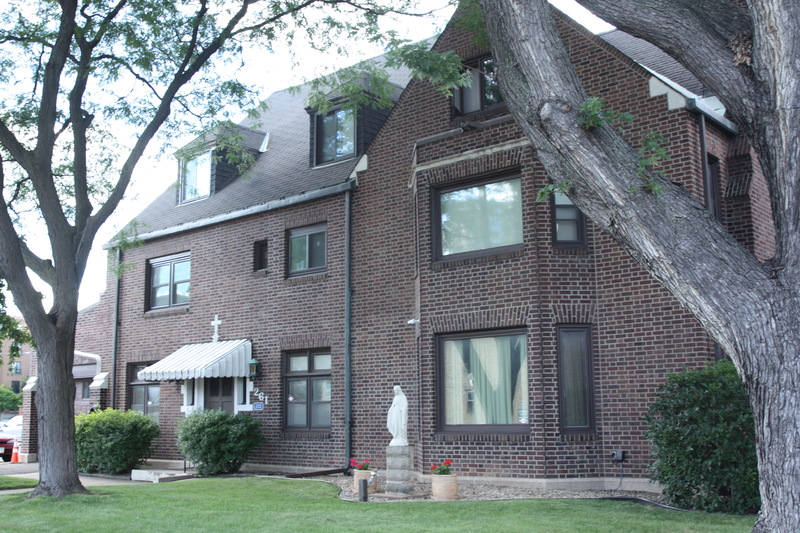 The parish house is attached to the east side of the church. The steeple’s prominence seemed to grow as I moved away. Notice the parish house on the right. First Baptist Church at 499 Wacouta was dedicated in May of 1875. 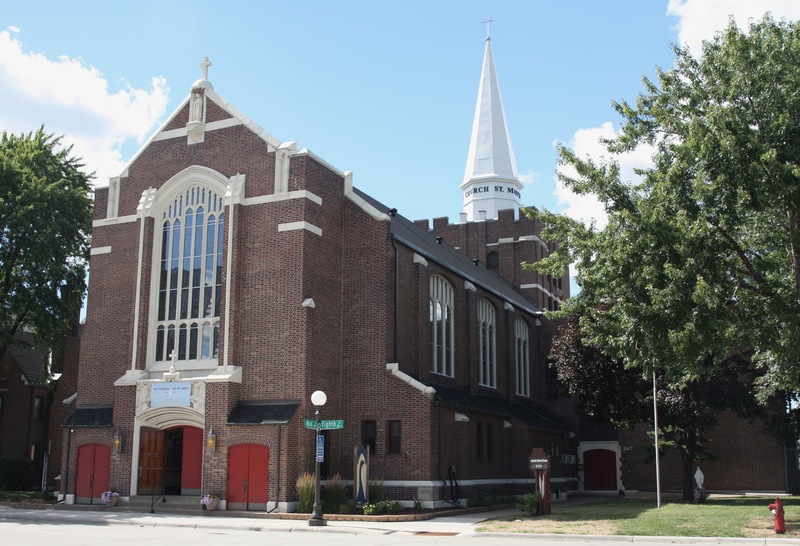 Close by, another church, this one a Lowertown landmark more than 125 years old, beckoned. 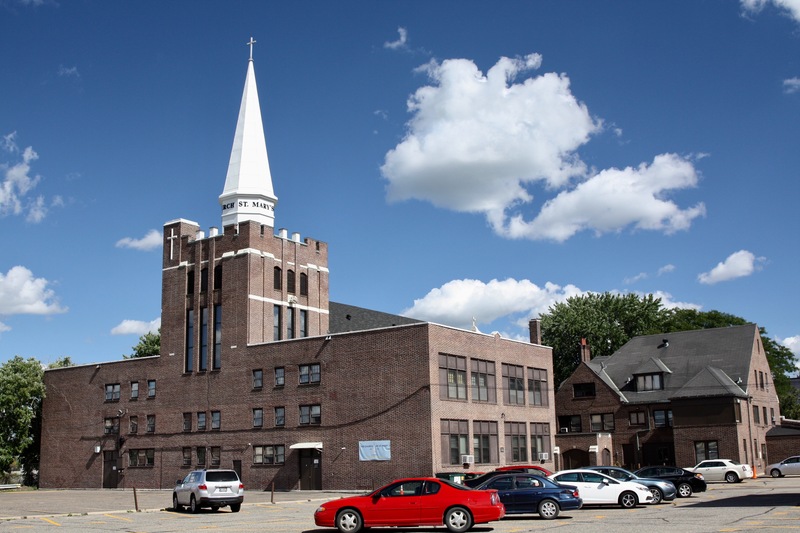 This building at Ninth and Wacouta is the third home of the First Baptist Church of Saint Paul. According to the Minnesota Historical Society, Harriet Bishop (Saint Paul’s first teacher) and pastor John P. Parsons from Vermont, worked together to form the church. Twelve men and women, including Bishop (Harriet) and the bishop, formally approved the church covenant on December 29, 1849. The small congregation initially met in Bishop’s schoolhouse. 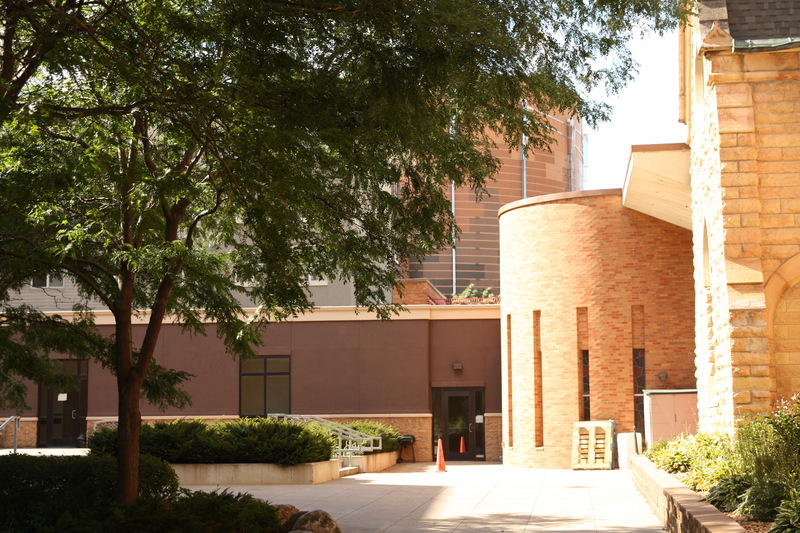 Two years later the parishioners moved to a new meeting house on the present site of Lowertown’s Mears Park. In 1862 First Baptist Church relocated to a newly constructed stone chapel at Eighth and Wacouta. By the early 1870s the congregation had grown to more than 300 members leading to the need for a bigger church. The current building, which opened in May 1875, was the largest and most expensive religious structure built in city, according to church history. 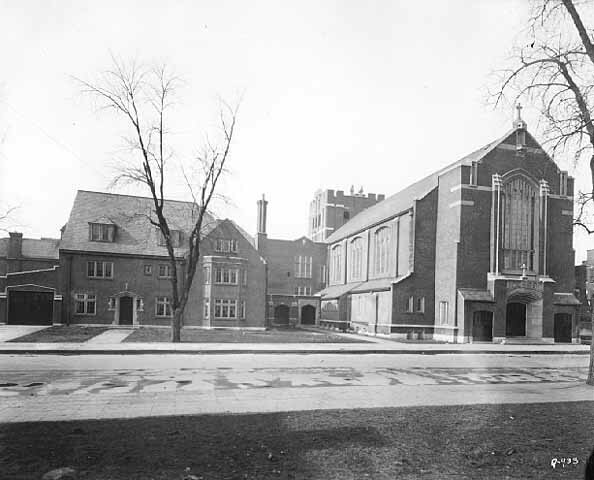 The 1875 chapel building in the background, and an addition from 1967 to the right. 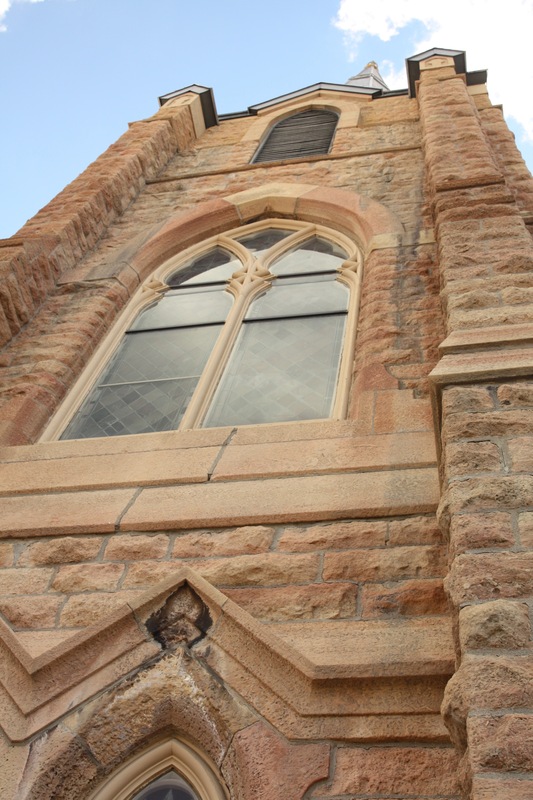 Church records indicate First Baptist congregants have been progressive since its early years. 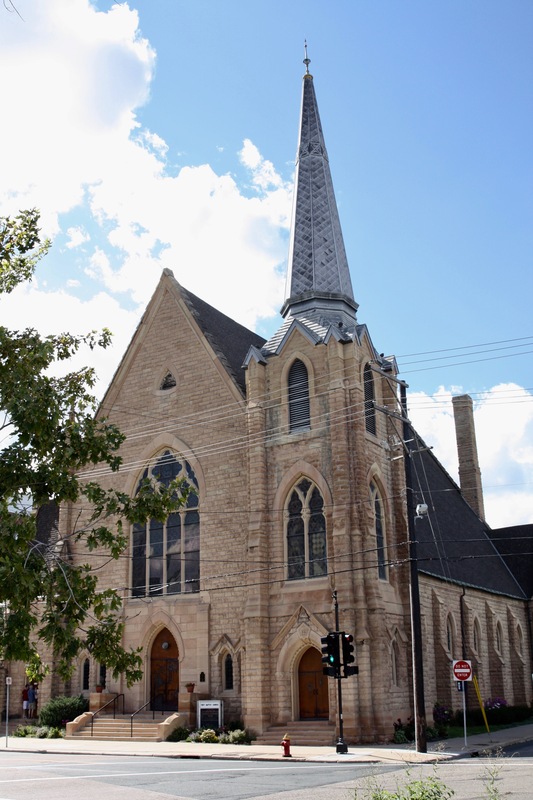 Although reports vary, First Baptist had some limited involvement in the creation of Pilgrim Baptist Church, Minnesota’s first African American congregation. Reports are that a group of former slaves led by Robert T. Hickman settled in Minnesota in May 1863. A year later they were granted “mission status” by First Baptist. In November 1866 Hickman and other former slaves officially created Pilgrim Baptist Church. A Chinese language bible class was started in 1912. During World War II, First Baptist welcomed 25 Japanese people who came to Minnesota from internment camps or stationed at Fort Snelling. At about the same time a large Mexican congregation worshiped there. 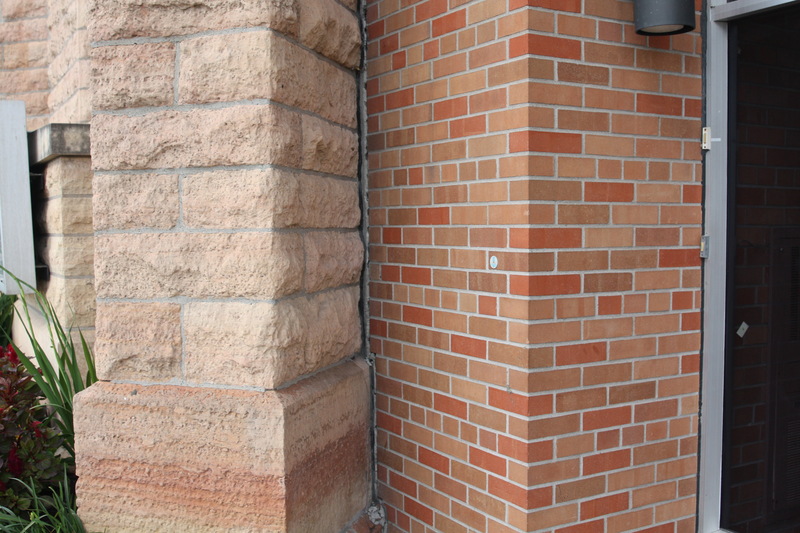 The stone work of 1875 building and the brick of the 1967 addition meet on the Wacouta Street side. First Baptist continues its tradition of serving immigrants who settle Saint Paul. 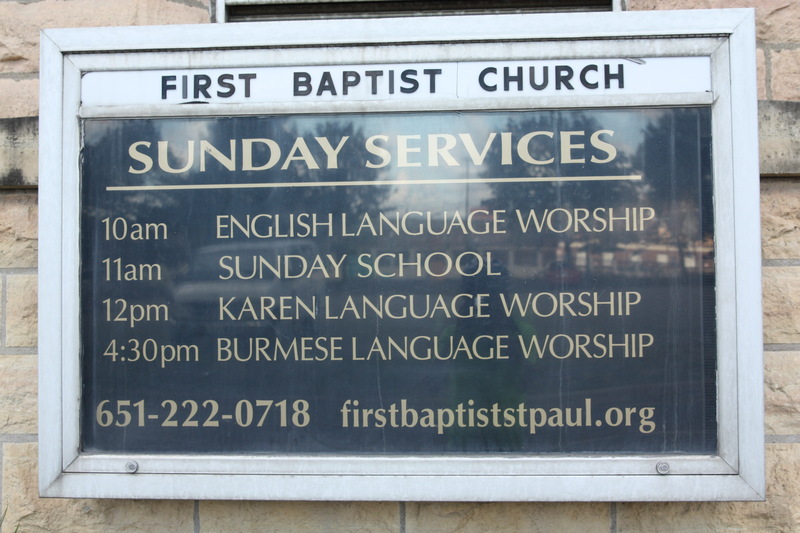 Burmese and Karen language services, as well as those in English, are offered weekly. 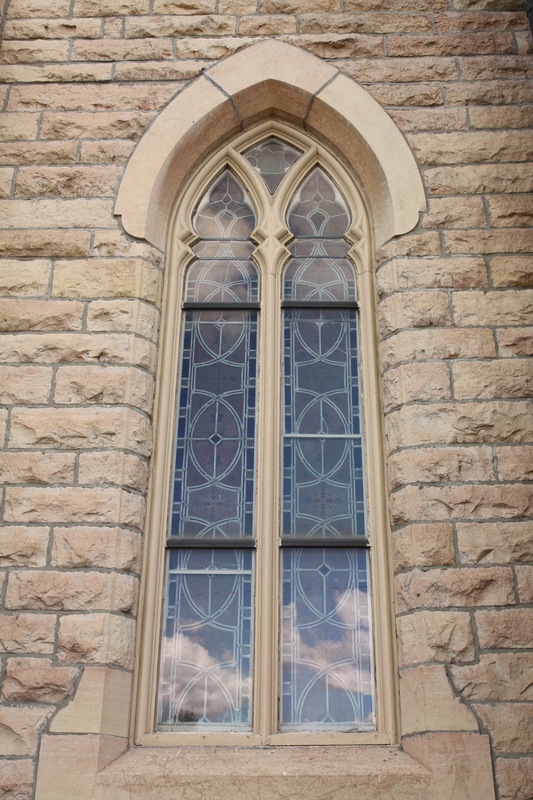 One of the lovely windows in the original First Baptist building. 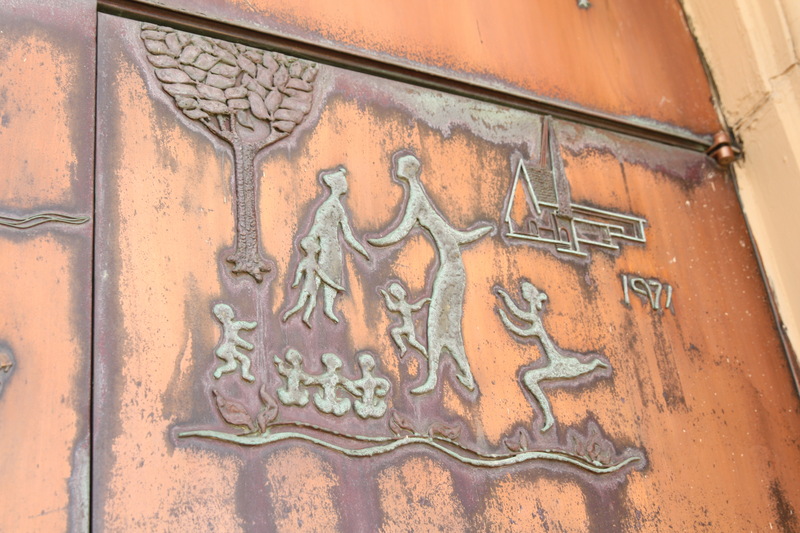 Copper doors, etched with scenes from First Baptist’s history, were added in 1971. 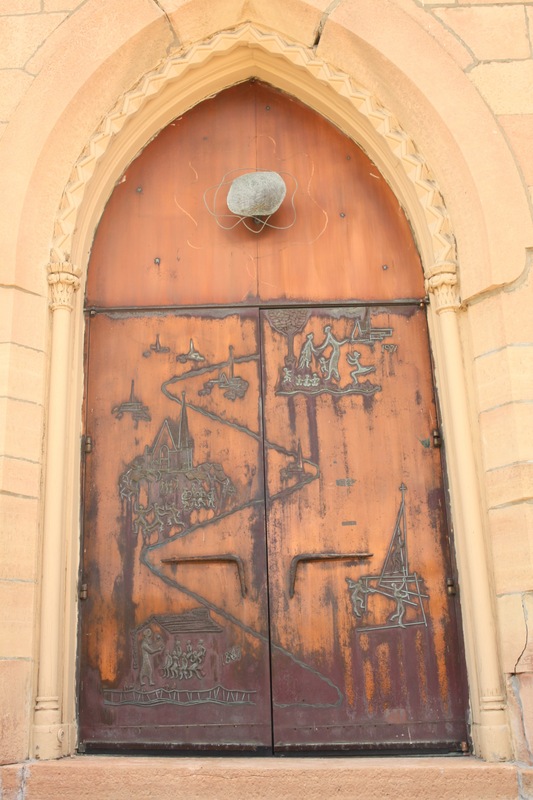 Norman B. Mears commissioned the design and installation of the copper doors. The nearby Mears Park was named for Mears in 1974 shortly after his death. The two Lowertown churches wrapped up the sightseeing portion of the ride, leaving just the eight mile predominantly uphill climb home. Click here for a map of this ride.